r dresser too much lately. A new watchband could spruce up the watch considerably and make it become a new favorite. When you have custom options to choose from, you really don’t need to wear a boring watchband, either. Here are some tips for helping you choose the right band for your watch. It’s important to choose a band that complements your watch. Leather is a timeless classic, which is why it’s a great option for most watch faces. However, you may prefer a lighter or darker shade, depending on the color scheme of your watch. Take a close look at the dial, hands, or markers to figure out where they fall on the color spectrum. The band should complement these colors. For example, dark brown leather looks great with brown dials. If the dials are black, you can choose any color leather band that you like, because black will match anything. Brown tones are warm and versatile, which make your watch a classic on any occasion. On the other hand, black leather provides a more formal look. If your watch has white or silver dials, then you can go with a darker or lighter band as you prefer. Both will offer a nice contrast. If the hands on your watch are colorful, you can use a band that complements them well and use the thread color that matches your dials. This will give the watch a cohesive look that can’t be replicated. 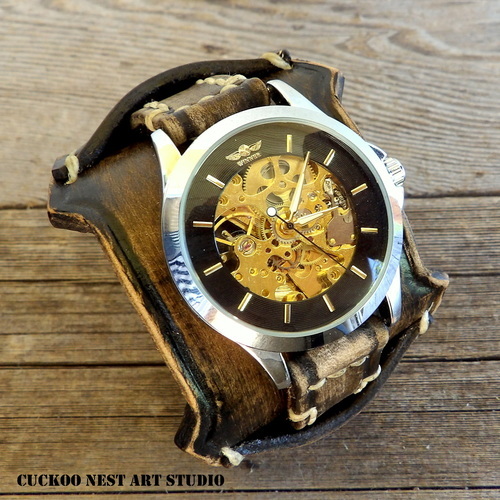 Leather isn’t just used for making watch bands. It’s also a popular material for clothing. Whether you have a leather jacket, shoes, or belt – you could consider matching you watchband to those items. If you wear leather shoes, you could also consider getting the same style of watch. If you don’t wear leather as often as you’ll wear your watch, you don’t really have to worry about doing this. On the other hand, if you have many different types and colors of leather in your closet, you could pick the one you like best or get more than one watchband to switch up your style. It’s important to consider the occasions you’ll be wearing your watch, too. If you’re going to a formal event or have to wear a suit for work, too much color can distract from the statement you’re trying to make. While a leather watch can complement a suit, it needs to be subtle and elegant. Suede or black leather might be your best options. If you’ll be wearing the watch at home or when you’re going about your afternoon activities, the watch doesn’t have to follow a specific standard. However, you might want to take a look at the color choices in your wardrobe to determine if dark or lighter leather goes better with what you normally wear. Of course, there’s no rule that says you can’t have more than one watch, maybe a watch for fun and one for work. With custom leather watchbands, it’s all about finding your personal favorite. If you don’t like the dark leather for your particular watch even though it’s supposed to match it better, then you shouldn’t get it. Every one of our custom leather watchbands is beautiful. We offer so many different choices, because we know that everyone has different tastes and preferences. You can also take advantage of additional customization to turn the band you like into the watchband you love. By choosing your stitching and accessories, you can turn any of our watchbands into one that’s just right for you. If you’re still torn on which watchband to get, it may be time to take a step back. There may be conflicting interests going on. For example, you might like a certain type, but you don’t think it would be formal enough for work. Instead of purchasing several different watches for every occasion, you could just get a handful of different watchbands. This allows you to dress up or down as necessary. Our watchbands can be adjusted to fit your watch face, but you can easily remove it and switch it out for another one of our bands.